Heat griddle or skillet; grease if necessary. Stir Bisquick, milk and eggs in large bowl until blended. Stir in remaining ingredients except pizza sauce and Parmesan cheese (batter will be thick). Pour batter by slightly less than 1/4 cupfuls onto hot griddle; spread slightly. Cook until edges are dry. Turn; cook until golden brown. Serve topped with pizza sauce. Sprinkle with Parmesan cheese. Replace the pepperoni in this recipe with chopped smoked turkey or turkey ham. 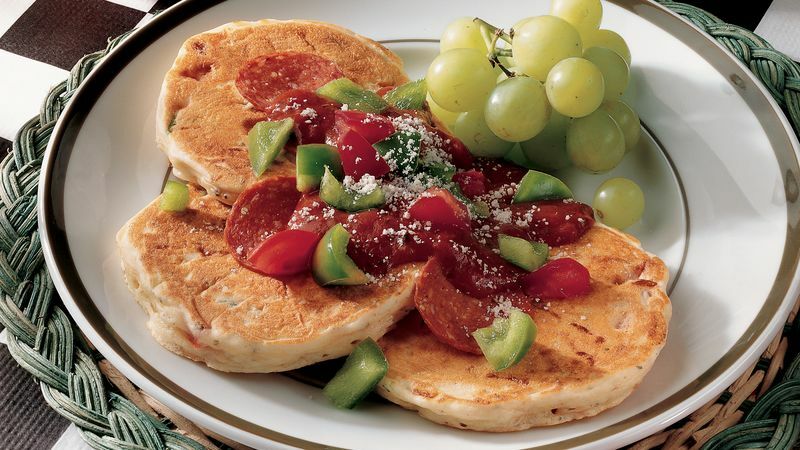 Serve these savory pancakes topped with additional chopped pepperoni, tomato and bell pepper.